There are 14 new faces in the first list of 48 candidates announced by the Shiromani Akali Dal (SAD) today for the coming assembly elections. However, the name of SAD president and Deputy Chief Minister Sukhbir Singh Badal did not figure in it, a development that gave rise to speculations that the party president may be contemplating changing his seat from Jalalabad. Even as the ruling SAD today released its first list of 48 candidates, Deputy Chief Minister Sukhbir Badal has said that a “determined and resurgent” SAD would announce all its candidates for the assembly elections within one week so that they may aggressively start their campaign at the earliest. Punjab Congress leaders, including PCC president Capt Amarinder Singh and CLP Leader Rajinder Kaur Bhattal, today met the party president Sonia Gandhi in New Delhi. The party incharge for Punjab, Gulchain Singh Charak, was also present at the meeting. The trio apparently met Gandhi to formally handover a copy of the resolution authorising her to nominate the candidates for the coming assembly elections. Only last evening, the party’s state election committee, which met under the chairmanship of the PCC president in New Delhi, passed a one-line resolution authorising Gandhi to nominate the candidates. Freedom fighters involved in the Kuka Namdhari Movement and the Jallianwala Bagh massacre are eligible for Swatantrata Sainik Samman Pension Scheme. The Centre has made it clear that the Kuka Namdhari Movement, 1871, and the Jallianwala Bagh massacre, 1919, have been formally included in the list of freedom movements recognised for pension. The Ludhiana (North) constituency had been a stronghold of the Congress since 1980 till the bastion was captured by the BJP in 2007. Harish Bedi is the sitting BJP MLA. However, political observers say Bedi this time has a tough contest at hand. In the 2007 poll, he managed through as Madan Lal Bagga, Congress leader who contested as an Independent, dented his party’s poll prospects. The Congress had fielded Rakesh Kumar Pandey. Though Bedi is a strong contender, BJP District Party president Rajiv Katna is also staking claim for party ticket. Muktsar: The state government on Friday agreed to give government jobs to the agitating Education Guarantee Scheme (EGS) teachers, who were holding protest demonstrations at Gidderbaha for the past couple of days. Octogenarian SGPC member Kuldip Singh Wadala has managed to seek SAD ticket for his son Gurpartap Singh Wadala from Nakodar constituency. Former MLA Kuldip Singh Wadala had unsuccessfully fought the seat against the sitting Congress MLA Amarjit Singh Samra in the last Assembly elections. With several units of the thermal plants in Bathinda and Ropar being shut down on account of tripping in transmission lines, some parts of the state plunged into darkness yesterday. With assembly elections round the corner, the SAD activists have started hectic preparations for the annual Shaheedi Jor Mela, to be held at Fatehgarh Sahib on December 26, 27 and 28. With political conferences at the mela scheduled for December 27, the SAD leaders are leaving no stone unturned to make the conference a show of strength. The state government today issued a notification regarding appointment of four Information Commissioners. They are Surinder Awasthi, a journalist, Narinderjit Singh, a former IAS officer, Ravinder Nagi, a mechanical engineer, and Harinder Singh Mann, a politician from Patiala district. Apprehending that the election code of conduct can be enforced in the state anytime by the Election Commission, the state government authorities acted swifty to complete the process for the appointment of Information Commissioners. The students of District Institute of Engineering and Technology, Nabha, have been attending their classes in a cramped and unsafe building. Students have made repeated complaints to the district administration, but to no avail. The PCMS doctors continued their agitation for the second consecutive day today in support of their demands. Meanwhile, the patients who had come to the civil hospitals, dispensaries and primary health centres were at the receiving end. They had to go back without getting examined. Instead of a political leader, BJP national president Nitin Gadkari today appeared more of a socio-economic expert discussing ways and means to tide over the current fiscal situation in the country. Gadkari was addressing a gathering at a city hotel on the occasion of the launch of his book "Vikas De Rah", a translation in Punjabi of his original book "Vikas Ke Path". Shiromani Akali Dal (Amritsar) president Simranjit Singh Mann today said he had placed the order for T-shirts that carried the name and image of Khalistan ideologue Jarnail Singh Bhindranwale. For his commitment to creating a pollution-free and green environment, Punjabi University has decided to confer honorary degree on renowned environmentalist Sant Balbir Singh Seechewal during its next convocation to be held in January 2012. University Vice Chancellor Dr Jaspal Singh said Punjab Governor and Chancellor of Punjabi University Shivraj Patil had approved the decision of the University Syndicate. Sohan Singh Lambardar, father-in-law of controversial SAD leader Simrjit Bains, was found murdered at his house in Noorpur Bet area today. The incident came to light when a milkman knocked at the door of the deceased’s house. “When he did not get any response, the milkman came to my house and asked me to enter Sohan’s Singh’s house. 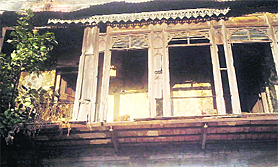 We found the house ransacked,” said Gurmail Singh, brother of Sohan Singh. The district police has arrested eight members of a gang involved in highway robberies last night. SSP RS Khatra said they got information that few youths were planning to rob a businessman near Ladpur village. A police team headed by SHO, Gobindgarh, cordoned off the area and arrested them. The absence of Sukhbir Badal’s name assumes significance as the names of all sitting SAD ministers and chief parliamentary secretaries who are to contest the poll have figured in the first list. The list also includes the names of three chief parliamentary secretaries, besides bureaucrats like PS Gill, DS Guru and SR Kler. Punjab Speaker Nirmal Singh Kahlon would contest from Fatehgarh Churian seat, Chief Minister Parkash Singh Badal from Lambi. 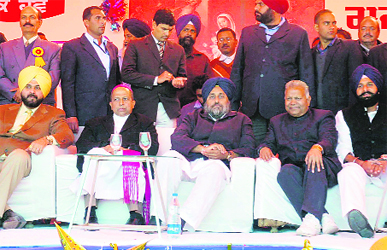 The CM is likely to fight against his brother Gurdass Badal, the likely People’s Party of Punjab candidate. The list released today includes 17 youth leaders and six women. The party said there were 14 new faces in the list in accordance with the policy to replace at least 40 per cent of the candidates to cut the anti-incumbency factor, if any. 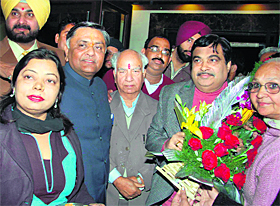 Panchayat and Rural Development Minister Ranjit Singh Brahmpura would contest from Khadoor Sahib, Speaker Nirmal Singh Kahlon from Fatehgarh Churian, Finance Minister Upinderjit Kaur from Sultanpur Lodhi, Agriculture Minister Sucha Singh Langah from Dera Baba Nanak, PWD Minister Parminder Singh Dhindsa from Sunam, SAD Youth Wing president Bikram Singh Majithia from Majitha, Food and Supply Minister Adesh Partap Kairon from Patti, Irrigation Minister Janmeja Singh Sekhon from Maur and Revenue Minister Ajit Singh Kohar from Shahkot. Former SGPC president Bibi Jagir Kaur would contest from Bholath constituency, Principal Secretary to CM Darbara Singh Guru from Bhadour seat whereas former DGP Parmdeep Singh Gill will contest from Moga seat. Veteran Akali leaders Tota Singh and Gurdev Singh Badal would be fielded from Dharamkot and Jaiton seats, respectively. 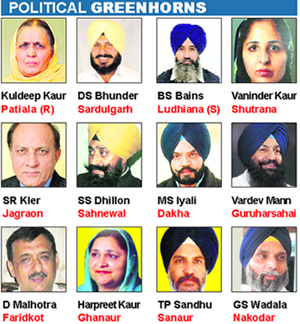 The new faces in the SAD list are Gurpartap Singh Wadala (Nakodar), Sharanjit Singh Dhillon (Sahnewal), Balwinder Singh Bains (Ludhiana-South), Manpreet Singh Iyali (Dakha), Parmdeep Singh Gill (Moga), Vardev Singh Mann (Guruharsahai), Dilraj Singh Bhunder (Sardulgarh), Darbara Singh Guru (Bhadour-SC), Kuldeep Kaur Tohra (Patiala-Rural), Harpreet Kaur Mukhmailpur (Ghanaur), Tejinder Pal Singh Sandhu (Sanaur), Deep Malhotra (Faridkot), Vaninder Kaur Loomba (Shutrana) and Shiv Ram Kler (Jagraon). The other candidates are Gurbachan Singh Babbehali (Gurdaspur), Sucha Singh Langah (Dera Baba Nanak), Amarpal Singh Bonny (Ajnala), Veer Singh Lopoke (Rajasansi), Inderbir Singh Bularia (Amritsar-South), Gulzar Singh Ranike (Atari-SC), Virsa Singh Valtoha (Khemkaran), Sarabjit Singh Makkar (Kapurthala), Ajit Singh Kohar (Shahkot), Bibi Mohinder Kaur Josh (Shamchaurasi), Sohan Singh Thandal (Chabbewal-SC), Chaudhary Nand Lal (Balachaur), Hira Singh Gabria (Atam Nagar) and Darshan Singh Shivalik (Gill SC), Mantar Singh Brar (Kotakpura), Sikander Singh Maluka (Rampura Phul), Sarup Chand Singla (Bathinda urban), Amarjit Singh Sidhu (Talwandi Sabo), Malkiat Singh Keetu (Barnala), Surjit Singh Rakhra (Samana), Hari Singh Zeera (Zeera), Ujagar Singh Badali (Kharar) and Harpreet Singh (Malout). Talking to mediapersons after a state-level function to mark Christmas celebrations, Sukhbir alleged that the Congress had no development agenda and had resorted to abusive politics that showed their desperation. Asked about changes, if any, in the SAD list, he said there would be some. He said winnability and loyalty towards the party would be prime criteria for allotting ticket. He said the talks were on with the BJP for swapping a few seats and the final seat-sharing arrangements would be announced soon. Rejecting the Lokpal Bill tabled by the UPA government, Sukhbir said by keeping the CBI out of the purview of Lokpal, the Union Government was proposing farce institution. He alleged the Congress had been misusing the CBI to harass political rivals and was deliberately keeping the premier investigating agency out of the Lokpal so as to arm twist its political rivals. Punjab Congress leaders, including PCC president Capt Amarinder Singh and CLP Leader Rajinder Kaur Bhattal, today met the party president Sonia Gandhi in New Delhi. The party incharge for Punjab, Gulchain Singh Charak, was also present at the meeting. The trio apparently met Gandhi to formally handover a copy of the resolution authorising her to nominate the candidates for the coming assembly elections. Only last evening, the party’s state election committee, which met under the chairmanship of the PCC president in New Delhi, passed a one-line resolution authorising Gandhi to nominate the candidates. Party sources pointed out that this was a standard practice and protocol to authorise the party president to nominate the candidates for the assembly or any other elections while the actual ground work was done at the state level. Apart from finalising the list of candidates, the issue of leaders from other parties joining the Congress is also learnt to have figured in the discussions. There is already some hue and cry being raised in different quarters about the entry of such leaders who were potential claimants for party ticket. After the party inducted Jagbir Brar and Kushaldeep Singh Dhillon, two founder members of the People’s Party of Punjab who were originally from the Shiromani Akali Dal, there has been resistance from the party cadres in Jallandhar Cantonment and Faridkot as the local leaders apprehend the duo might be accommodated at their cost. While the opposition in Jallandhar was muted, in Faridkot sitting Congress MLA Avtar Brar raised the banner of revolt reportedly at the behest of Bhattal. Amarinder has been maintaining that the leaders were inducted after approval from the high command. About ticket, Amarinder has been saying that it was the prerogative of the party president. As a petition filed by city-based Malwinder Jit Singh Waraich against the Union of India and other respondents came up for hearing, the Punjab and Haryana High Court observed that the Government of India, Ministry of Home Affairs, Freedom Fighter Division, has issued a letter stating that both the Kuka Namdhari Movement and the Jallianwala Bagh Massacre have been formally included in the list for pension under the 1980 scheme. Taking up another petition filed by Waraich, the Bench added the Ministry has also issued another letter stating that it has already made a submission in this High Court that Kama Gata Maru Movement was part of the freedom movement and it is a matter of historical record. “It has further been clarified that any participant of this Movement would be covered by 1980 scheme, and if he satisfies the eligibility criteria then he would be eligible for pension”. In this petition, Waraich had asserted that the sacrifices made by the martyrs and revolutionaries of Kama Gata Maru of 1914-15 have gone unnoticed. In this case also, even their names have not been recognised in the list of movements recognised for the purpose of Swatantrata Sainik Samman Pension Scheme, 1980. The Ludhiana (North) constituency had been a stronghold of the Congress since 1980 till the bastion was captured by the BJP in 2007. Harish Bedi is the sitting BJP MLA. However, political observers say Bedi this time has a tough contest at hand. In the 2007 poll, he managed through as Madan Lal Bagga, Congress leader who contested as an Independent, dented his party’s poll prospects. The Congress had fielded Rakesh Kumar Pandey. Though Bedi is a strong contender, BJP District Party president Rajiv Katna is also staking claim for party ticket. PROMISES: Prior to elections, Bedi had promised getting roads constructed on both sides of the Buddha nullah, laying of a storm sewerage, helping businessmen get rid of sales tax nakas at various points in the city and building other infrastructural facilities. However, not all the promises have been fulfilled. While the road on one side of the Buddha nullah has been constructed, it is incomplete on the other. The storm sewerage at Gur Mandi is also yet to be completed. Besides, a few bridges are under-construction. VOX POPULI: The residents say the MLA is easily accessible and has facilitated development. But they are quick to criticise him over the slow pace of development. The Wadalas have already planned a rally in their native Sarin village on December 26, which will be addressed by Chief Minister Parkash Singh Badal. Former SGPC president and two-time MLA Bibi Jagir Kaur, who had lost to Sukhpal Khaira in the last tenure, has been fielded again from Bholath. Khaira’s close associates have termed it as “a sorry state of the Akalis going by the fact that she was still facing trial in the CBI court over her daughter’s death”. Finance Minister Bibi Upinderjit Kaur will contest again from Sultanpur Lodhi. So will Ajit Singh Kohar, Revenue Minister, who will contest from Shahkot this time as his old constituency Lohian has been dropped after delimitation. Sources said heavy fog in the past two days led to the tripping of 220-KV transmission lines. This led to cascading effect on the other transmission lines resulting in many units being shut down by the authorities of the power corporation. Punjab State Transmission Corporation (PSTCL) Director Transmission Ravinder Singh said tripping of transmission lines during fog was a regular feature during winters. The total power demand of the state is about 4,000 MW but because of the temporary closure of the thermal units, the gap between demand and supply has touched the figure of 1,100 MW. Because of the problem, many areas of Punjab, including Ludhiana, Patiala, Jalandhar, Bathinda and some other parts, witnessed long power cuts. The agriculture sector was also affected. In Ludhiana, power regulatory measures were to be imposed and now three-day weekly off has been enforced on the category three arc/induction furnaces till further orders. Senior functionaries of the Punjab State Power Corporation Limited (PSPCL) have assured that by tomorrow, the power crisis would end and all units of the thermal plants would become operational. Officials of the PSPCL further said two units of the Lehra Mohabat became operational on December 22 but two were still closed. “One unit at Lehra Mohabat would be functional by today evening and the other one will be operational tomorrow. Three units of the Ropar Thermal Plant which were closed would resume working soon. Our engineers and other staff members are on work and hopefully all thermal units would be operation soon,” Verma said. While PPP president Manpreet Singh Badal has announced not to hold any political conference at the mela, the Congress leaders have announced that the conference would be attended by the party leaders in large numbers. Splinter Akali factions and the radicals will also hold separate conferences but they are unlikely to rake up controversial issues in order to maintain the sanctity of this religious occasion. Jor Mela is organised as the martyrdom day of the sons of Guru Gobind Singh and lakhs of devotees throng the mela to pay obeisance at gurdwara Fatehgarh Sahib and gurdwara Jyoti Swarup. Last year also, the Sikh high priests had appealed to politicians to avoid politicising religious function but still the mela was used as a political centrestage by both Congress and Akalis. Harcharan Bains, media adviser to Punjab CM, has confirmed that the entire state cadre of the SAD would be there and elaborate preparations have been made at the state level. “We are focused to address the religious gathering and ensure that the masses are addressed by the senior leadership,” he said. However, infighting in the Akali Dal has come to fore with party’s general secretary Prem Singh Chandumajra and district SAD president Jagdeep Cheema trying to hold separate meetings. According to the Congress leaders, associated with the arrangements for the event, party activists from Patiala and surrounding districts of Ludhiana and Ropar have been assigned the task of mobilising workers. Fatehgarh Sahib SSP RS Khatra said elaborate arrangements have been made for the religious as well political gatherings and additional 1,200 policemen would be deputed for the event. “The entire area has been divided into four zones and a SP-rank official would oversee the arrangements,” Khatra added. The heavy traffic would be diverted and makeshift police stations would also be also set up at the venue to ensure that people do not face any harassment. Sources said the office of the Governor was requested today morning to get the file cleared regarding these appointments at the earliest possible. They have been appointed against the vacant slots available in the office of the Information Commission. The Commission has posts of one Chief Information Commissioner and 10 Information Commissioners. Of these, four slots were vacant and three more will become vacant in about five weeks from now. Confirming the appointments, Financial Commissioner AR Talwar said the notification had been issued after their names were approved by Governor Shivraj Patil. However, these commissioners will formally occupy the office only after the administration of the oath of office to them by the Governor. Sources said the state government had already submitted a request to the Governor to give time to administer the oath. Responding to a query that whether the enforcing of code of conduct can create problems in holding the oath-taking ceremony, a senior official said there would be no problem in this regard. He said the process regarding the appointments had been completed. “The administering of the oath was just a technical requirement to occupy the office. Otherwise, the appointments have already been made,” said the official. However, the Governor has not yet cleared the names of three other persons - SP Singh, Ashok Kumar Goel and Parveen Kumar - all former IAS officers, for appointment as Information Commissioners. A proposal regarding their appointment was submitted to the Governor separately. Their names were proposed for appointment against the slots to be vacated by three Information Commissioners - Kulbir Singh, PPS Gill and Ravi Singh - in the last week of coming January. The students of District Institute of Engineering and Technology, Nabha, have been attending their classes in a cramped and unsafe building. Students have made repeated complaints to the district administration, but to no avail. They handed over a memorandum to Patiala Deputy Commissioner Vikas Garg about shifting of their classes to a new building, saying that the present building was unsafe and lacked space for them. Talking to The Tribune, one of the students said that the building they were studying in was in a shambles. "The strength of the institute is around 200 and we have only two halls in which four classes are taking place. There is a lot of disturbance and one cannot focus on studies. Moreover, except two halls and the office area, other parts of the building are unsafe and could crumble anytime," she added. Another student said that apart from the condition of the building, monkey menace was another common problem in the institute. He said, "Many monkeys lived in the building and often pick our food. They have even bitten two students in past. There is no direct bus for the students coming from far off places like Nangal, Ropar, Khamano, Ludhiana, Jagraon. Patran, Barnala, Samana, Ghanaour and Rajpura. And due to which girl students often have to take a lift from private vehicles or travel by trolleys." Deputy Commissioner Vikas Garg said the administration was looking for some space to shift the students, but has not yet found it. Dr Hardeep Singh, state president of the PCMS Association, Punjab, said the association had rejected the notification of one PG increment and threatened to intensify their stir till all of their demands were fulfilled. He said the government had failed to notify the promised academic allowance, conveyance allowance to all PCMS doctors, dynamic ACP at 18 years of service, rank of Deputy Civil Surgeon to SMO, health risk allowance and cadre review. Instead of a political leader, BJP national president Nitin Gadkari today appeared more of a socio-economic expert discussing ways and means to tide over the current fiscal situation in the country. Gadkari was addressing a gathering at a city hotel on the occasion of the launch of his book "Vikas De Rah", a translation in Punjabi of his original book "Vikas Ke Path". Using interesting anecdotes, Gadkari laid stress on starting entrepreneurial ventures in small groups with the help of NGOs in villages. "I have started a sugar factory in my village in Nagpur where we also started subsidiary industries for biogas, ethanol and methane production. We are giving jobs to 10,000 people and are in expansion mode," he said. He also gave a word of advice, "Do not always depend on governments. Use your own resources. That's what I even tell my party MPs and MLAs." He shared his experiences as a PWD Minister in Maharashtra where he first introduced the concept of BOT projects and got debentures floated to raise the income. Others present at the event included former MP and cinestar Vinod Khanna, BJP state incharge Shanta Kumar, national general secretary JP Nadda and MP Navjot Sidhu. The leaders will participate in a state-level rally to be held tomorrow in the city. Hondh-Chillar whistleblower Manwinder Singh, meanwhile, denied having any link with the pro-Khalistani T-shirts seized by the Ludhiana police recently. He said the trader was not selling weapons but simply making T-shirts. “The police has unnecessarily exaggerated the issue by showing that the T-shirt maker was indulging in anti- national activities,” he said. For his commitment to creating a pollution-free and green environment, Punjabi University has decided to confer honorary degree on renowned environmentalist Sant Balbir Singh Seechewal during its next convocation to be held in January 2012. University Vice Chancellor Dr Jaspal Singh said Punjab Governor and Chancellor of Punjabi University Shivraj Patil had approved the decision of the University Syndicate. Sant Seechewal participated in many functions of the university and appreciated the steps taken by it to promote pollution-free environment, the Vice Chancellor said. When he entered the house, he was shocked to see the body of Sohan Singh lying in a pool of blood. He raised an alarm and informed the police. The Ladhowal police reached the spot and started investigation. “Prima-facie, it appears that robbery might be the motive behind the murder. However, the police is investigating the case from all angles,” said the investigating officer. During preliminary investigations, the police observed that the killers entered the house by scaling a wall. They broke open the entrance door and then entered the bedroom where they attacked the victim with wooden logs. After killing Sohan Singh, they ransacked the house and decamped with cash, gold ornaments and a double-barrel gun. Gurmail Singh said Sohan Singh was living in his house alone after the death of his wife. He said his brother owned a petrol station and used to keep cash at home. “The robbers might have got the information that Sohan was living alone. Finding an opportunity, they killed my brother,” he lamented. The police has registered a murder case against unidentified assailants. The police recovered three pistols, live cartridges, sharp-edged weapons, Rs 1.40 lakh in cash, four motorcycles, four cars, computers, laptop, gold ornaments and other items from them. He said the gang was headed by one Jasbir Singh, a resident of Khanna town, who came out of the Nabha Jail three months ago. He said the gang was involved in 18 major cases in Fatehgarh Sahib district and other parts of the State.